A fact-finding report revealed that Adani personnel have been forcefully acquiring land, while violating laws and harassing Santhal tribes. 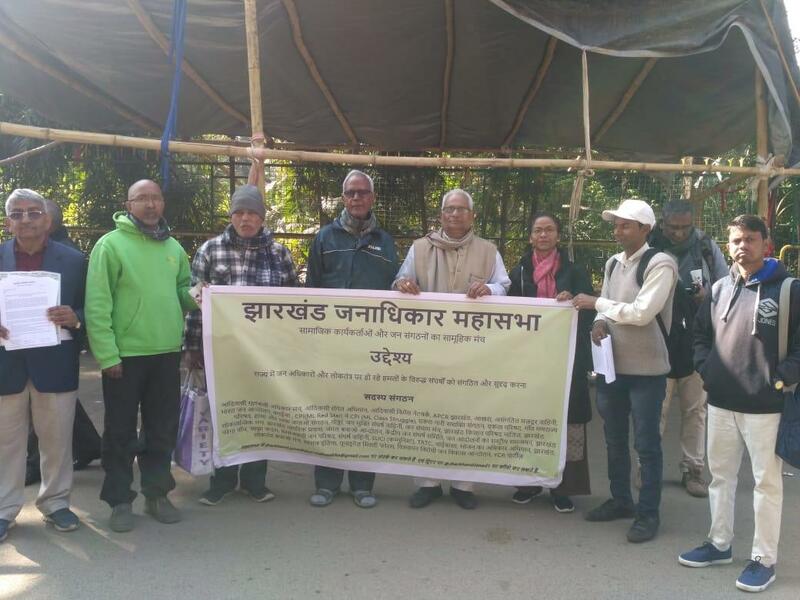 Demanding an immediate stop to the “illegal” land acquisition for the proposed Adani power plant in Godda district in Jharkhand, the Jharkhand Janadhikar Mahasabha (JJM), an umbrella network of more than 30 people’s organisations, has submitted a representation alongside a fact-finding report to the state governor Draupadi Murmu. “Crucial public hearings such as Social Impact Evaluation and Environment Impact Evaluation were manipulated, and local administration has blatantly showed support to this power plant for acquiring land. 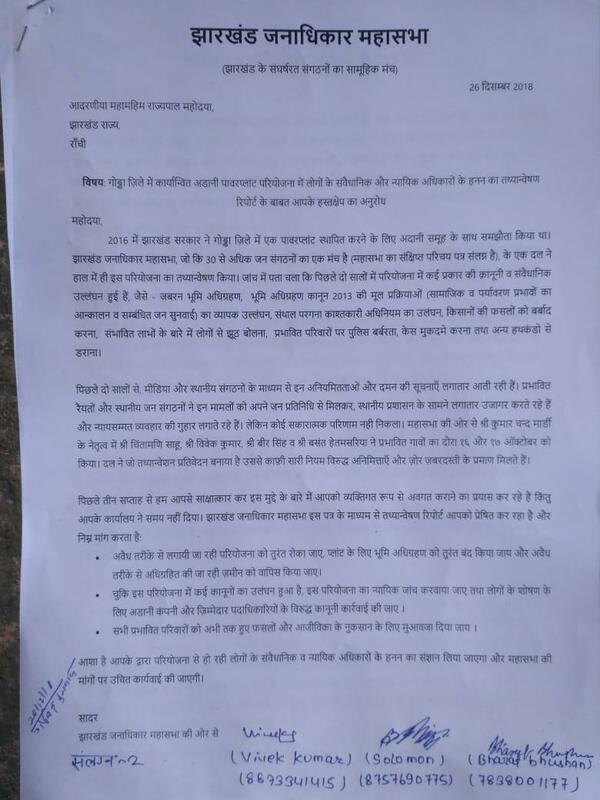 Adani company personnel have been threatening land owners, taking over land without notice, forcibly throwing out inhabitants from their dwellings, destroying crops and plantations, capturing common public places or lands in blatant violation of rules and regulations,” Vivek Kumar, representative of the JJM told NewsClick. In February 2016, Adani Power, a subsidiary of Adani group proposed to the BJP-led Jharkhand government for setting up a 1600 MW coal fired power station in Godda district. As per the proposal, all the power generated will be exported to Bangladesh. As per the ‘Social Impact Evaluation Report’ of the Adani company, about 1,363.15 acres of land is proposed to be acquired in ten villages of Godda and Preyahaat blocks, to set up two units of power plant with an investment of Rs. 15,000 crore. According to the fact finding report by JJM, at the end of October this year, nearly 500 acres of land have already been acquired from four villages namely Mali, Gangta Gobindpur, Motia and Patwa. The villagers, however, are resisting the hand over their land. Mali and Gangtha Gobindpur villages are fully inhabited by Santhal tribes. Over 40 families have been affected by this illegal acquisition of land as per the report. “This project is being set up by grossly violating various laws and rules. Tribal and poor farmers are being harassed and their lands as well as livelihood is being taken away in contravention of the law. Adani Group has adopted a series of manipulations and mis-representations to subvert legal processes,” the reported stated. Adani Power Plant, a Public Project? The Jharkhand government has categorised this power plant under the ‘public project’ category. “Since, Coal will be imported for this project from Australia and the generated electricity will be sold to Bangladesh, people of Godda and Jharkhand are not going to benefit in any way from this project. Hence, categorising this project as a ‘public project’ is a gross violation of the provisions of the Land Acquisition Act,” explained Vivek Kumar. As per the report, tribals have been threatened with dire consequences and false cases even as their traditional burial grounds have been demolished. tube wells used for irrigating crops have been damaged and hundreds of palm and other trees, which were the source of livelihood for these poor tribals, have also been uprooted.